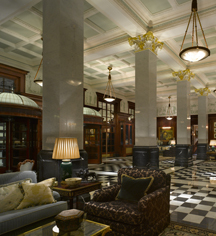 On the River Thames in the heart of the West End, The Savoy has been London’s defining luxury hotel since 1889. Boasting some of the most well-known bars and restaurants in London, The Savoy has set world-class standards of excellence for over a century as evidenced by its enduring legacy of bespoke service and amenities. Built on the proceeds of the Gilbert and Sullivan operas produced by Richard D’Oyly Carte, The Savoy has played host to royalty, world leaders, and legends of the stage and screen for generations. Having seen the opulence of American hotels in his many visits to the U.S., English talent agent Richard D’Oyly Carte decided to build the first luxury hotel in Britain to attract foreign clientele as well as British tourists who had travelled to London for theater and sightseeing. Opening in 1889, the hotel was designed in the Edwardian style by architect Thomas Edward Collcutt, who also designed the Wigmore Hall, an internationally acclaimed concert hall. The hotel was built on a plot of land, next to the Savoy Theatre, that Carte originally purchased to house an electrical generator for the theatre (built in 1881), which was the first public building in the world to be lit entirely by electricity. Construction of the hotel took five years, and it was the first hotel lit by electric lights and the first with electric lifts. Other innovations included private, en suite baths in the majority of its 268 guestrooms, lavishly appointed in marble; constant hot and cold running water in each room, dinner dances, glazed brickwork designed to prevent London's smoke-laden air from spoiling the external walls, and its own Artesian well. Over the years The Savoy’s luxurious furnishings, prestigious amenities, and impeccable service have attracted numerous esteemed guests. Many early Hollywood greats such as Katherine Hepburn and Clark Gable stayed at The Savoy. The Prince of Wales and his coterie were frequent visitors. Glamorous guests included Marilyn Monroe and Elizabeth Taylor; and from the world of music, The Beatles and Elton John. Artists Whistler and Monet both used views from Savoy windows in their work. The Savoy London, a charter member of Historic Hotels Worldwide since 2011, dates back to 1889. The hotel was built on a plot of land originally purchased to house a generator for the neighboring theater, the first electrically lit public building in the world. Upon the hotel’s completion, it became the first hotel ever lit with electric lights. Adjoining Rooms: Adjoining rooms subject to availability. Please notify request at time of booking. Airport Transportation: An airport shuttle may be arranged through the hotel's concierge, GBP 180 per vehicle one way. Please contact hotel in advance to reserve. Parking: Valet parking: Available; GBP 50 per day (in/out privileges). Pet Policy: Service animals allowed: Yes. Pets allowed: Yes. Restrictions: Dog and Cat Friendly. Maximum weight: 20 kilos. Fees: £25 per day, per pet. Guide dogs are always welcome and are exempt from the charge. Rollaways: Available upon request; GBP 90 per night. Transportation: Limo and town care service is available, rates apply. 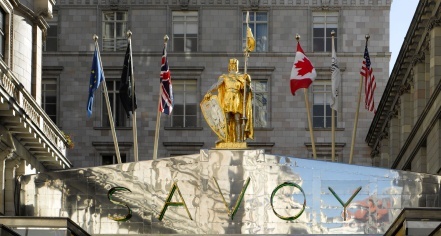 Learn more about the History of The Savoy London .